In DH Digital we're at an incredibly exciting crossroads. We've spent the past 2 years laying the groundwork for a digital support service that would transform the health and care system. That's about to start, and we're looking for some brilliant people to get involved in doing it. I'm very lucky to have been looking after DH's digital strategy for much of that period, and played a very small part in helping the service come to fruition. My fantastic role - which is also up for grabs - has given me humbling breadth to discuss big questions with some of the biggest brains in government (and way beyond). So this thought piece, not entirely representative of DH's current opinion, draws heavily on insights from discussions with policy, strategy and delivery gurus within and outside DH over the past 18 months. They may well not agree with this. It is an alpha proposal, which needs lots of work. But it might contribute to the ongoing discussion about two of the biggest questions in government right now. Namely: how do we know what we should be doing? And how will we show it is working (or not)? In the past we've called that 'policy'. But I don't think that's the right word any more. 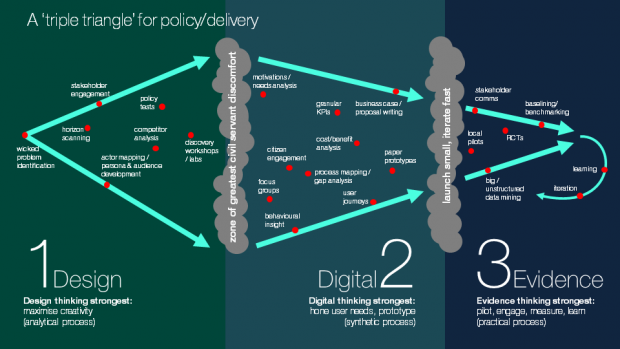 "In a digital age, policy making is largely broken". Government must recognise that digital approach has the potential "to allow or even require a different operating model for government." So say two powerhouses of government leadership, Mike Bracken (at GDS) and Paul Maltby (at the Cabinet Office). 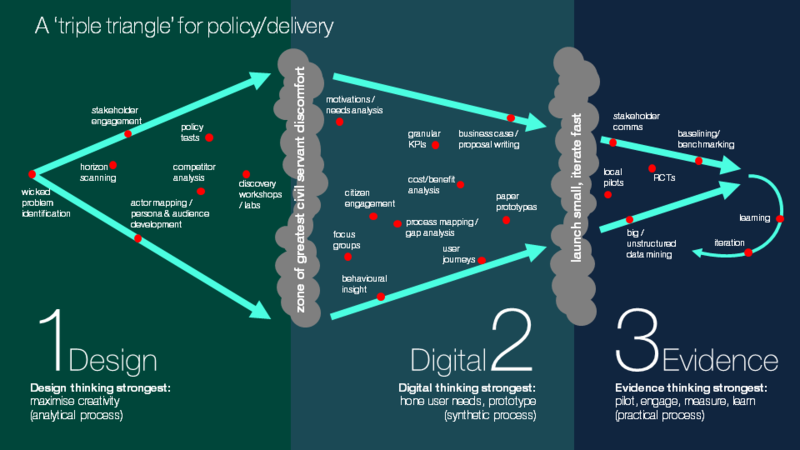 They're right - digital is both the catalyst and the enabler, at every stage of governing. Incredible people at the heart of central government - PolicyLab and Open Policymaking amongst many others - have shown that injecting disruption into traditional planning processes can massively transform the eventual shapes of policy, outcomes, expectations and delivery. The subtly creative blend of ethnography with design thinking in particular has been crucial in helping us rural cousins convince our elders and betters that we must pivot our work away from bureaucracy and towards recipients, to make their lives easier, and ours much cheaper. But planning alone couldn't have created this situation. It's needed encouragement from the disruptors. 'Show the thing,' championed by GDS, Nesta, Futuregov, Helen Hamblyn and others, has thrown down the gauntlet by challenging, making and delivering, much faster than traditional government can. My hunch is that they're in a large part responsible for bullying the civil service into publishing, blogging and tweeting as much as they have now discovered they can. Thank you. And it also - finally - feels like the dawn of the evidential age. Oliver Letwin's line on 'evidence based policy making' provided inspiration at the first What Works report launch in 2014. The Behavioural Insight Team amps up data insight to a volume that can't be ignored. And the (much more than) minimum viable beauty in data visualisation, being produced by tiny teams from data.gov.uk and ONS to Sunlight and the delightful David McCandless, finally explains what the point of all this is, in language that inspires. it's like a perfect storm for revolutionising the way we plan and deliver state services to the public. And they’re all happening, all together, right now. So how might it all fit together? and the impact measurement that evidence-based policy making needs to succeed. The red blobs show where existing tools might fit into the model process. But there are plenty more - and plenty not yet thought of - which may replace some of these. No one of design, digital and evidence can offer the whole solution. All three overlap, but there are certain strengths and weaknesses that need to be taken into account at each stage. Design thinking could (arguably should) risk taking place unconstrained by thoughts of evidence or practicality. Digital transformation, by its nature continually iterating, can be accused of drifting from an initial set of requirements (often because the prize for solving a problem which only surfaces through reimagination can be so huge). KPI setting could (though shouldn’t) sideswipe innovation in pursuit of beancounting. But there are some underpinnings which digital should take responsibility for. From gathering big and rich data at the start to inform the user needs, through rapid prototyping and iteration, to low-effort evidence collection and crowdsourced analysis throughout a policy product’s life, there is no excuse for not (re-)using cheap, transparent tools which encourage experimentation, produce visually stimulating outputs, and inspire deep insight. Policy is dead; long live planning, engagement, delivery and evaluation. Thanks Philip. Yes, this is a thought piece, and I completely agree - being the digital team, our audiences always come first and so if we did take this further, we'd only ever want to start with policy teams and those that policy impacted upon. As for the quote - it's about 2/3rds of the way through the article, and the earliest example I can find of the 'policy-based evidence making / evidence-based policy making' quote I can find. We moderate for spam. Thanks for the discussion points! who moderates these comments & to what end please?